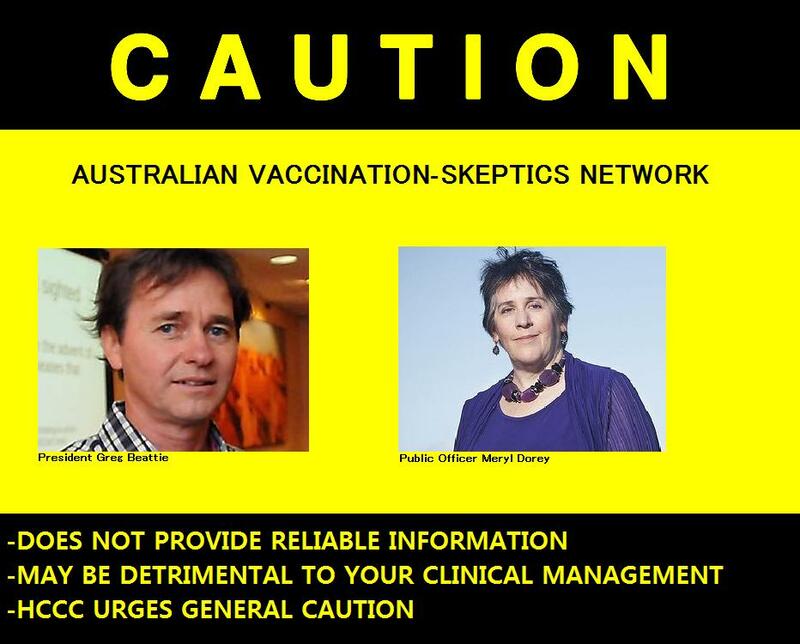 It has been a long time coming, but today I was informed of a new Health Care Complaints Commission (HCCC) public warning issued against the Australian Vaccination-Skeptics Network (AVsN) formally the Australian Vaccination Network (AVN). …AVN does not provide reliable information in relation to certain vaccines and vaccination more generally. The Commission considers that AVN’s dissemination of misleading, misrepresented and incorrect information about vaccination engenders fear and alarm and is likely to detrimentally affect the clinical management or care of its readers. This is amazing news. 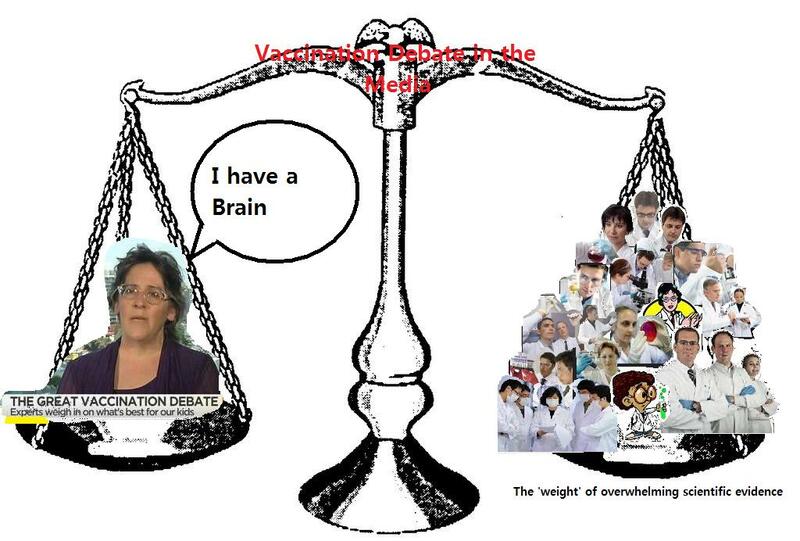 Meryl Dorey, public officer and former president of AVsN, has for years been spreading misinformation to the public under the guise of “informed choice”, “vaccine safety advocacy” and “health freedoms”. She feels that her 20 years of so-called research give the same level of expertise as a doctor despite the fact that her only qualification is that she “has a brain“. This latest warning from the HCCC is another win for those who advocate for evidence based medicine in Australia. Well done to Stop the Australian Vaccination Network (SAVN), the HCCC and everyone else involved! Know, check, protect: says who? “Know, Check, Protect” is the catch-cry for the 2014 World Immunisation Week. World Immunisation Week is a campaign spear-headed by the World Health Organisation (WHO), and runs in the final week of April every year. As the week comes to a close I thought I’d jump on my little soap box and blog about something close to my heart: Vaccinations. One of the main messages of the campaign this year is just how important it is to be up-to-date with your boosters. Why do we need boosters? The simple answer is that immunity to certain diseases fades with time. This means that although adults may have received all of their childhood vaccinations, they could become vulnerable to some Vaccine Preventable Diseases (VPDs) later on in life. In Australia one the most worrying VPDs that we have seen a resurgence in is Whooping cough. Check out this graph from NSW health that shows thousands of reported cases at the peak of the epidemic from late 2010- early 2012. Whooping cough is one of these diseases that requires a booster. Without a top-up vaccination every few years adults leave themselves open to contracting this disease. Follow this link to read the experiences of a lady who caught whooping cough in her 30’s. I’m sure after reading that you’ll agree that this illness is a nasty piece of work. While whooping cough is awful no matter what age you are, it has the potential to be fatal in babies. Babies are also at a higher risk of contracting the disease until they have received all their scheduled vaccination. This is where herd immunity is important. When adults aren’t up-to-date with their boosters they form potential pathways for disease to reach our communities’ most vulnerable. If the population maintains a high level of herd immunity then these diseases have less chance to spread. So boosters aren’t only important for adults to protect themselves, but they are an integral part of creating a safe and health community. I want to finish off this blog by introducing my readers to an awesome group called the Northern Rivers Vaccination Supporters Group (NRVS). These guys are taking their community responsibility to a whole new level. Not only are they looking after their own boosters and getting their own families vaccinated on schedule, they have come to together to spread the word about vaccination in their local area. We are a group of local people who have got together with a shared interest in increasing the immunisation rates in our community. We want to try to reduce the risk of epidemics of contagious disease, prevent the pain and suffering that vaccine preventable disease can cause, and protect the vulnerable who are unable to be vaccinated because of age or illness. The Northern Rivers region in New South Wales has the lowest immunisation rates in Australia. In one town, Mullumbimby, less than 50% of children aged 2-5 have had their routine childhood vaccinations. This means that we are at very real risk of epidemics, and already our community suffers higher than the national average rates of preventable disease. NRVS will be celebrating their 1st birthday tomorrow! Happy Birthday guys! If you, dear reader, wish to send them a birthday present then please head on over to the NRVS website to get some information so you KNOW more about vaccinations and the diseases they protect against. Book an appointment with your GP to CHECK your boosters are up-to-date. And help PROTECT your community through herd immunity.